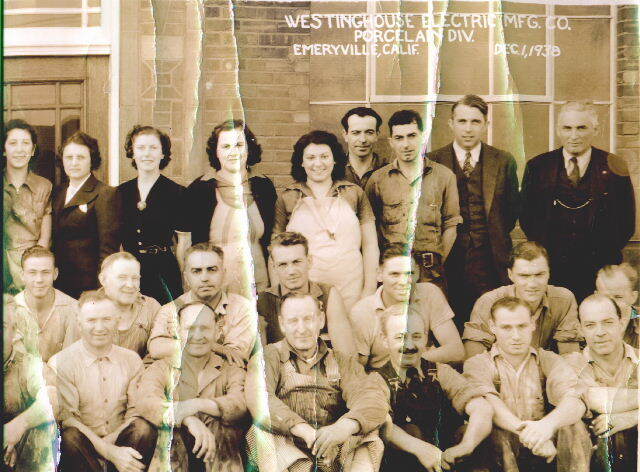 The photo is of the employees of Westinghouse Electric Mfg., Porcelain Division, Emeryville, Alameda Co., CA. It was taken on 1 Dec 1938. My grandfather and his cousin are in this photograph. My grandfather, Joao “Bohne” Pacheco Smith is standing in the background in between the man in the suit and the woman. Joao has the light colored shirt on. Standing next to him is his cousin, Manuel Bonita. My grandfather held many jobs. Prior to this, he and my grandmother were living in Salinas, CA. He worked on a sugar beet farm. After Westinghouse, he was a grave digger. In the 1950s just before he died he was a janitor at a school. Some of the people in this photo must have lived in the neighborhood with the Pacheco Smith’s. My grandma told me that the man in the front with the mustache was German. He stuffed his shirt with newspapers in the morning to ward off the chill. Funny how my grandmother remembered that 50 years after the fact. I guess some things stick with you.